Angela James and Cammi Granato are inducted into the Hockey Hall of Fame. 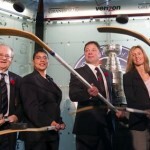 TORONTO – Thanks to Angela James and Cammi Granato, women are finally in the Hockey Hall of Fame. But the breakthrough moment comes at a time when female players are still defending their game. Some hockey observers had wondered if the day would ever come. But on Monday morning, James and Granato accepted their rings with former NHLer Dino Ciccarelli and builder Jim Devellano. The late Daryl (Doc) Seaman, one of the founders of the Calgary Flames, was also inducted. The Hall of Fame established separate induction criteria for females this year, paving the way for James and Granato to receive plaques alongside the game’s greats. It was a proud moment not only for both women, but for many others involved with the sport they love. “I just don’t understand why they have to justify themselves, how good they are,” said James. “They’ve worked really hard to get to where they are, they’ve made a lot of sacrifices. We should just embrace it… . The high point of Granato’s career came while James was experiencing one her most trying periods in the game. The Toronto native was left off the Canadian team when women’s hockey made its debut at the 1998 Olympics in Nagano, an event where Granato and the U.S. team won gold with a victory over Canada. Granato thinks James’s omission played a big part in the American victory.